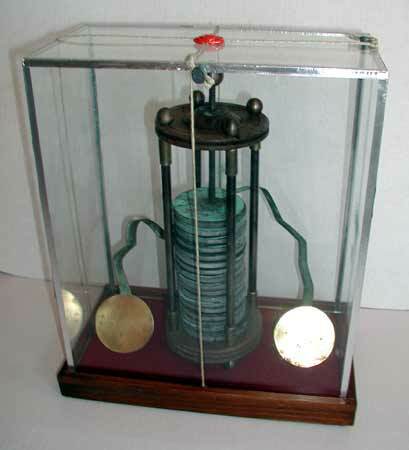 The most widely used source of electrical voltage for telegraph circuits was the 'Gravity' or 'Crow's Foot' battery and other similar 'wet' batteries. 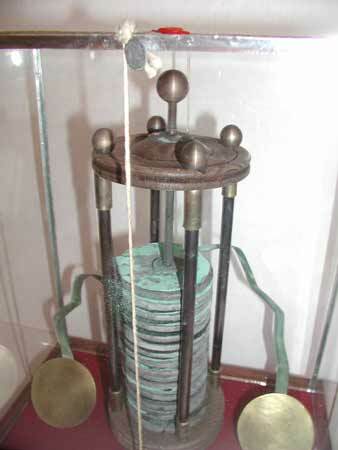 0000t The first battery was demonstrated by Volta in 1799. 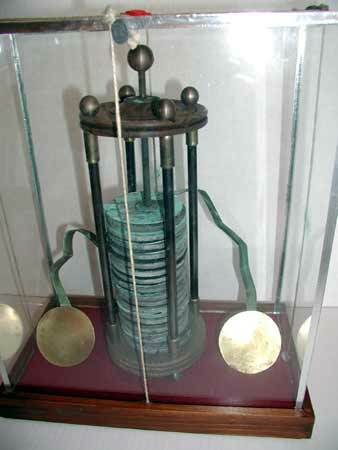 (14KB) He made his 'Voltaic Cell' by piling up alternating disks of copper and zinc and separating them by salt-water moistened pads. 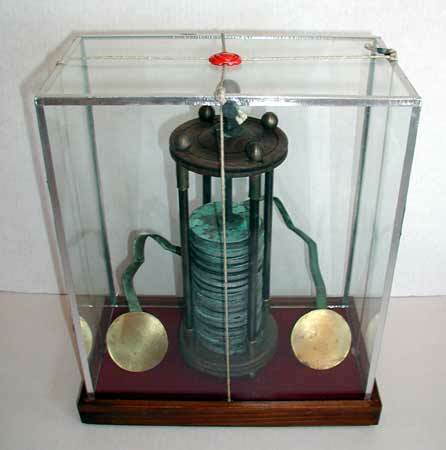 This museum quality handmade replica of the first voltaic cell was completed in 1999, 200 years after Volta made his first cell. Every detail has been precisely recreated. After Volta demonstrated his battery, many versions were made. 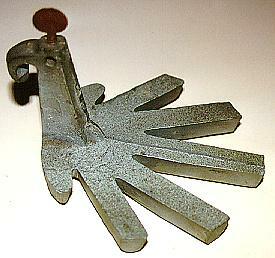 The most widely used of these was the "Crow's Foot" battery which was named after the unique foot-shaped zinc electrode. 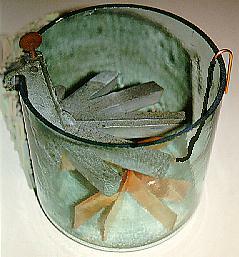 Crow's Foot batteries typically were contained in a 6-inch diameter by 8-inch high glass jar. 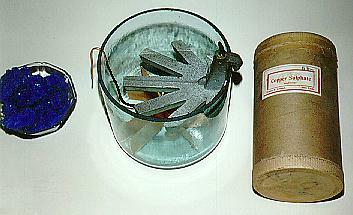 A copper star-shaped electrode rested on the bottom of the jar and an insulated wire led up and out of the jar carrying the positive voltage. 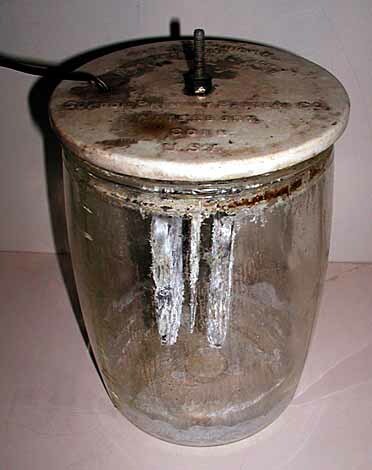 A zinc "crow's foot" shaped electrode was suspended in the upper portion of the jar. 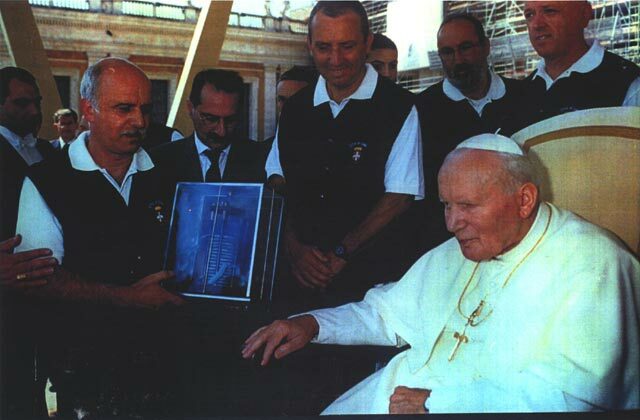 The Jar was half filled with water and a considerable amount of copper sulfate or "blue vitriol" was added to the water. After a period of time, the battery would begin producing a voltage of about 1 volt. The following description of how the battery works is from: "Electric Wiring" by Albert A. Schuhler. McGraw Hill, 1943. It is in the section entitled: "Telegraph Wiring, Job 208, Gravity Cell"
"The electrolyte is derived from a blue vitriol and water solu- tion. 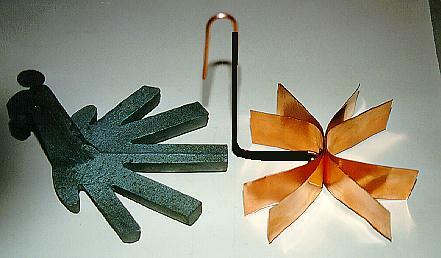 The blue vitriol must completely cover the copper element, and sufficient water must be added to cover the zinc element. 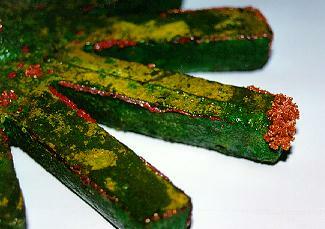 A teaspoonful of sulphuric acid is added to this solution to give the best results. 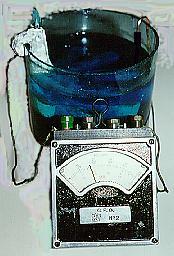 In order to prevent creep- ing of the electrolytic salts, the top of the jar is generally dipped into hot paraffine. Best results are obtained by pouring a layer of pure mineral oil over the top of the electrolyte, because it prevents evaporation as well as the creeping of salts. To put the battery into service after these steps have been taken, it is necessary only to place the cell an a short circuit for about 24 hours. 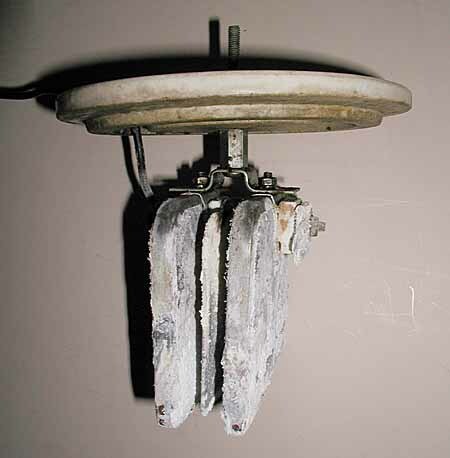 This action produces a light liquid called sulphate of zinc, which forms around the zinc element and protects it. 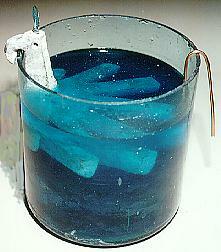 The copper sulphate solution, which remains at the lower end of the jar, is the heavier liquid. Very little care is required for the maintenance of gravity cells, because all they require is an abundant supply of blue vitriol and water. 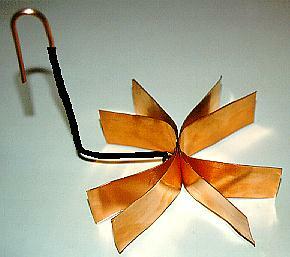 The best results are obtained when both liquids meet at a point midway between the zinc and copper elements. When the blue line falls too low, that is, on the level with or below the top of the copper element, blue vitriol and water should be added. 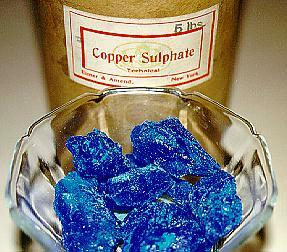 When the copper sulphate begins to fade in color to a light blue, it indicates that blue vitriol should be added. Care must be taken that the blue vitriol crystals fall to the bottom and do not rest on the zinc crowfoot. The blue line should never be permitted to reach the zinc element. If the line rises anywhere near the zinc, the copper sulphate should be siphoned out by means of a hydrometer syringe, or the cell placed on a short circuit. As long as the cell continues in action, the quantity of sulphate of zinc increases. When this becomes too dense, or above 1.15 specific gravity, the top of the liquid should be siphoned out and water added to the remainder." 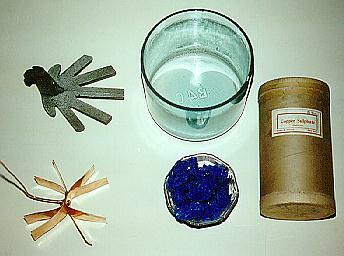 The following photographs show a typical crow's foot battery and its components: PLEASE NOTE: The battery shows the copper sulphate and water mixture BEFORE it separates into the two layers and no visible dividing line can be detected. 0001 GORDON PRIMARY BATTERY:(20KB) This is another style of Telegraph Battery. The writing on the cover reads: GORDON BATTERY, Patented Oct. 27, 1896, Apr 13, 1897, Feb. 13, 1900. R. S. A. Signal Cell. Gordon Primary Battery Company, Waterbury, Conn.
0005 WHITE CERAMIC WATERBURY BATTERY JAR COVER:(23KB) This is a typical white ceramic battery jar cover. It was placed on top of a glass battery jar and the electrical connections were made to screws mounted in the holes on top of the cover. 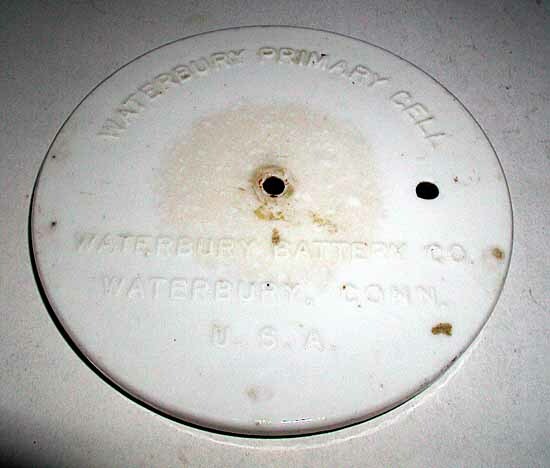 The battery manufacturer usually cast their name into the cover and, in this case it is clearly visible and reads: WATERBURY PRIMARY CELL, WATERBURY BATTERY CO. WATERBURY, CONN. USA. It would be interesting to know the relationship between this company and the GORDON Battery Company (See number 0001). 0006 WHITE CERAMIC EDISON BATTERY JAR COVER:(25KB) This cover simply reads: EDISON, Made in USA. It has a special additional hole (marked 'oil' through which ' battery oil ' could be added. 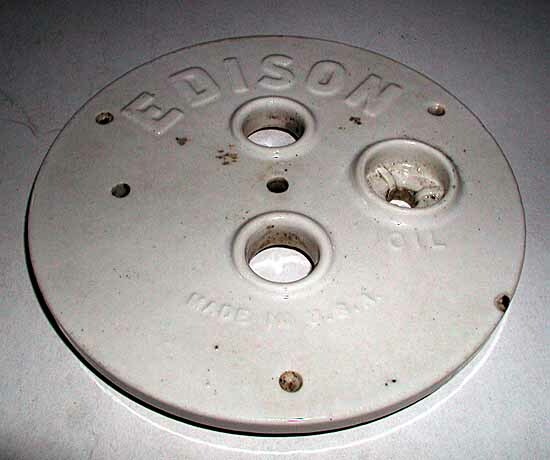 Edison battery oil covered the solution in the battery and reduced evaporation.